Reba is the twin sister to Fantasia and is every bit as nice. 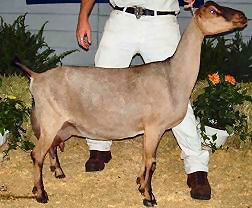 Reba more closely resembles her dam being a very powerful doeling with great feet and legs and a very wide escutcheon. Reba's first show in Nov of 2005 earned her a 2nd place right behind her sister! Update: Reba was Junior Champion under Donna Shepherd at the Carrollton, GA show! Unfortunately Reba was lost in a freak accident this past summer. We were saddened as she had lots of potential plus a great personality. 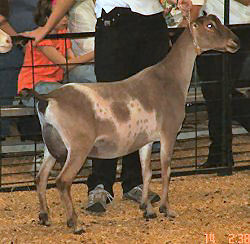 Reba's dam, Fanci, pictured here at 3 years the day she was BOB and BUIS! GCH Twin Cypress OOHTC Flutterby is Reba's 3/4 sister pictured here as a 2 year old first freshener.